The 5008 wll debut in Frankfurt. PARIS -- Peugeot has revealed the first images of its planned 5008 compact minivan, which will go on sale starting in the autumn after a debut at the Frankfurt auto show in September. The launch of the five- and seven-seat minivan will mark a strategic reversal by PSA/Peugeot-Citroen, which until now has reserved the highly competitive sector for Peugeot's sister brand Citroen. The 5008 will compete directly with Citroen's Xsara and C4 Picasso, which were Europe's leading minivans in 2008, with sales of 238,769 units. 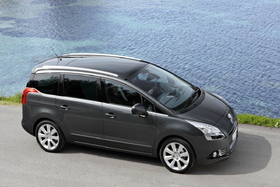 The 5008 will also compete with Renault's redesigned Scenic and Grand Scenic, which are now launching across Europe. Renault sold about 175,000 Scenic and Grand Scenic models in Europe during 2008, which it calculates was good for a 14 percent share of the minivan market. Renault gives Citroen credit for a 15 percent market share, but Citroen says its segment definitions actually give it a 22 percent share. Both carmakers agree that the European minivan sector has suffered in recent years, losing sales to crossovers and SUVs. Minivan sales dropped to 1.2 million units in 2008 from 1.5 million units in 2007, and could drop as low as 800,000 this year, according to Renault's segmentation data. The French brands say their new product offerings should increase interest in the sector starting in 2010. Peugeot's new 5008 is based on the same platform as the 308 compact hatchback and the 3008 crossover. It will be 4530mm long, compared with Citroen's C4 Picasso, which is 4470mm long and the C4 Grand Picasso, which is 4590mm long. The minivan will feature the diesel and gasoline engines already seen on the C4 Picasso, and will be priced similar to the Citroen minivans.